Our first Fraud Fair was on October 10th on a lovely sunny fall afternoon. Twenty five people put aside the holiday to attend, including me, and it was worth every minute. 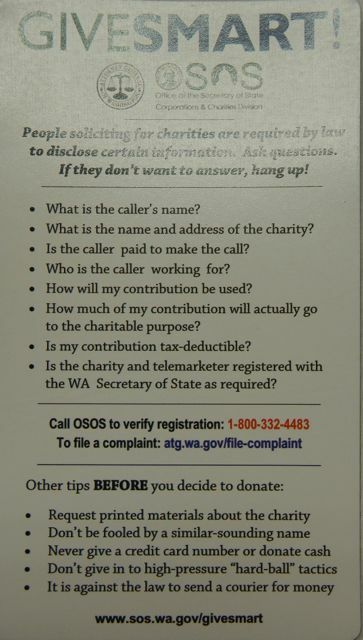 Those attending received magnetized lists of questions to ask telemarketers, helpful phone numbers for several state offices, including Office of Secretary of State Charities Division, State Attorney General Consumer Protection, Department of Financial Institutions Consumer Services, and Utilities and Transportation Commission Fraud Prevention. All of these agencies have online services for more education on frauds and fraud prevention. 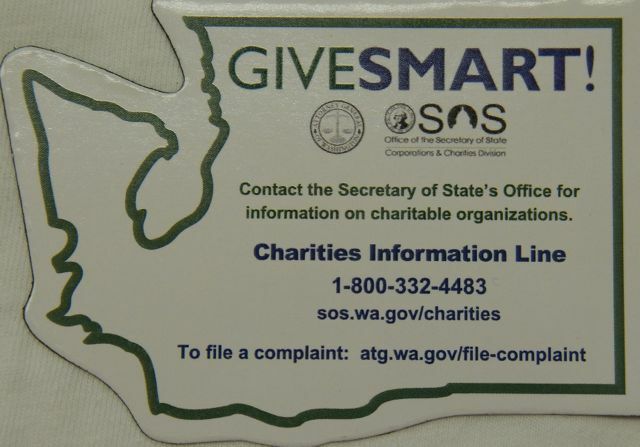 ask for their names, the name of their firm, the name of the charity they are calling for, if they are registered in the state, how much of the money that is donated goes to the charity—I have the magnetized list now for easy reference. 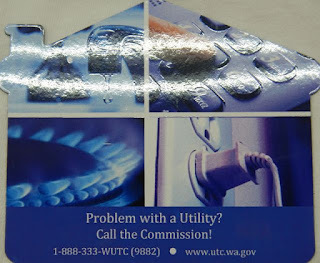 The presenters know the current phone scams going around: police, sheriff and firemen’s charities, IRS scams, Microsoft scams, the stranded/arrested grandchildren scams. Missing bank card scams. And there are mail scams, Facebook scams, email scams. Funding for areas hit by natural disasters often appear overnight on Facebook, for example. Those communities never see a penny of that money. How much do scammers make? Around $3 billion per year. If you have money invested in stocks and bonds, there are other scams to watch for: unregistered brokers. Unregistered stocks and bonds. The Nigerian Prince. The deal too good to pass up. Licensed financial services people are registered with the state. 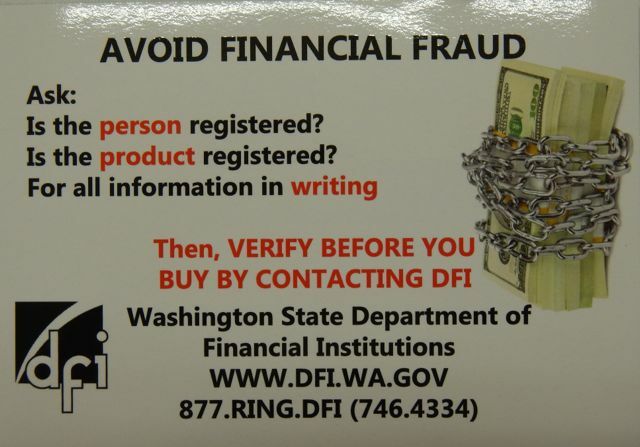 You can check this online or by calling DPI (877-746-4334) or www.dfi.wa.gov. Bottom line on scams: Trust, but verify the sources independently first. Ask questions. 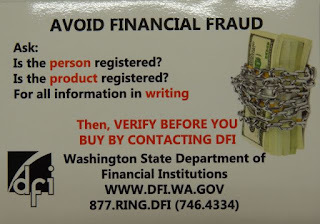 If you are scammed or suspect a scam, tell people (friends, family, local professionals), tell these state offices and agencies. Only one in every 44 people who is scammed ever says anything. Don’t let the con artists talk you into keeping silent. You can always say no, hang up, and block that calling number. The Foundation is going to offer this training again next year. If you would like to be notified when this is scheduled, please send your name and email address to info@spccf.org. We will add you to our email list. 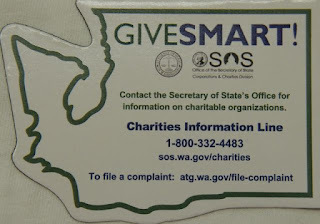 As a public charity and a nonprofit corporation, SPCCF is registered with the Washington Office of Secretary of State. We know you can find us on the state’s registry!